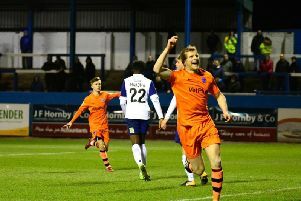 Town’s assistant manager Phil Hughes said The Shaymen were “bitterly disappointed” after losing 1-0 at Chesterfield, a result which saw the gap from Halifax to the bottom four reduced to two points. Ex-Town striker Scott Boden’s penalty on his first appearance since rejoining The Spireites clinched the result for the hosts, lifting them out of the drop zone, while Halifax remain in 16th. Hughes, who handled the post-match media duties in place of manager Jamie Fullarton, said: “It’s a hard result to take. In the first-half it was a tight game. “Second-half, I thought it was a penalty. It looked a penalty from where we were. “Thereafter we tried to get back on level terms. “But in fairness to us, if that was a penalty then ours is a penalty on Matty Kosylo. “He got in the box, a clear opportunity to cross with three or four players in the box, and he got pulled back as well. It is now six hours since Halifax last found the net, while they have not scored in five of their last six games. On the fact that the gap to the relegation zone had been closed with the result, Hughes said: “We have an important period of time coming up. Over the next three games we’ve got teams in and around the bottom to play. “But like previous occasions when we’ve had these set of games coming up, we always tend to do well and pick up points when it matters, and I think that’s the case. “We need to take each game as it comes, but we’ll be fully focused on the Aldershot game. On the mood on the dressing room after the defeat, Hughes added: “Clearly we’re all bitterly disappointed. Ultimately, we’re all trying to get to the same point where we’re winning games, we don’t want to be losing. “That’s happened and that’s going to have a disappointing effect on everybody.